This week’s news focused on the Federal Reserve Bank’s Open Market Committee meeting on March 21st, with minimal speculation about the outcome of the meeting — an increase in the Federal Funds overnight rate. There was a surprisingly mild reaction in the bond and stock market after the Fed hiked the rate from 1.5 to 1.75%, and increased their economic projections. But — when the Fed meets, the real impact on the market is in the minutes of the meeting and commentary by individual Fed officials. The Fed revised the pace of future rate increases in 2019-2020, with members split between those that see the rate increasing from 1.75% to 5% and those wanting to maintain current levels. You can read the full report of their economic projections here and the press release from the meeting results here. The big takeaway: a strong consensus that mortgage rates will increase over the next few years. 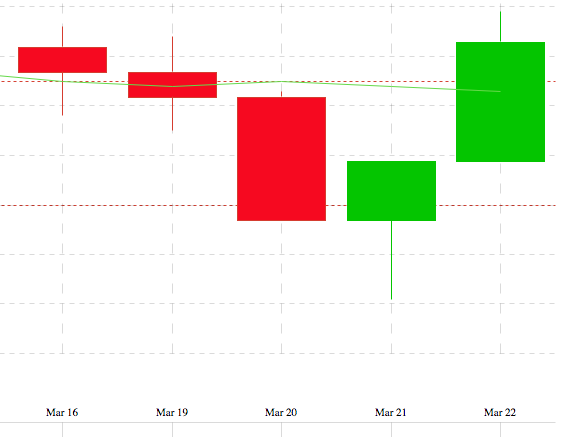 This week’s candlestick chart, below, shows more sideways movement in Mortgage Backed Securities (MBS) over the past week, with a slight dip after comments by Fed Chairman Powell. MBS directly impact mortgage rates, and the days with red indicate higher and green lower rates. “The average contract interest rate for 5/1 ARMs decreased to 3.83 percent from 3.93 percent, with points increasing to 0.68 from 0.45 (including the origination fee).” All rates are for 80 percent LTV loans. Weekly mortgage rates and trends from Bankrate is a compilation of mortgage and economic experts from across the country. 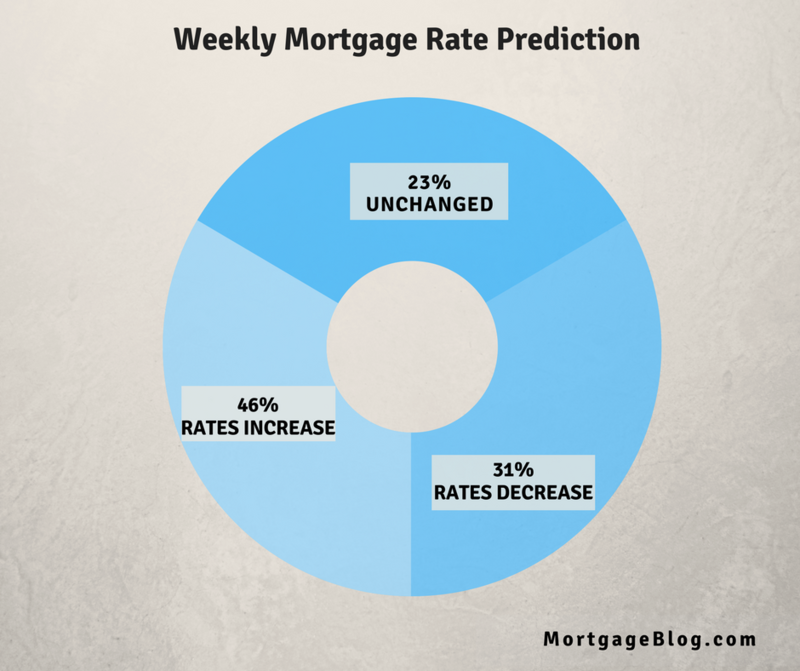 Predictions for the coming week: 46 percent of the panelists believe mortgage rates will rise over the next week or so; 31 percent think they will fall, and 23 percent believe rates will remain relatively unchanged (plus or minus two basis points). Lock or Float Interest Rates? Recommend locking a rate if you are in contract to purchase a home with a closing date in the next 45 days. There may be volatility in the markets over the next several weeks, due to continuing fears of trade wars, as the US announces official tariffs on China at the week’s end. There is a lot of fear in the markets around the negative impact on global economies.